österreichischer Physiker (1874-1915). 2 autograph manuscripts, both signed on flyleaf ("Prof. Dr. F. Hasenöhrl"). Wien. 2 Bde. (1), 314, (1) SS. ; lose einliegend 2 Bll. Formeln. 260 [recte 248: Paginiersprung von 229 auf 240; 1 revidiertes Blatt vom Verfasser nach der Paginierung entfernt], (3) SS. Schwarze Tinte auf kariertem Papier, gelegentliche Ergänzungen in Blei- und. 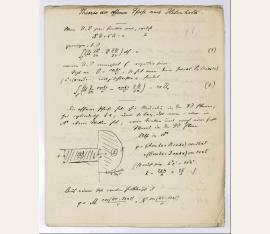 Hasenöhrl's Mechanics lecture manuscripts, used and revised throughout the great physicist's last seven years of work, mainly composed in 1907/08 and bound for the author around that time. His name is on the flyleaf in his own hand: "Prof. Dr. F. Hasenöhrl / Wien, Universität". The volumes comprise the complete first two lectures (Mechanics and Continuum Mechanics) of Hasenöhrl's four-year cycle, which also included Electrodynamics, Theory of Heat, and Optics. 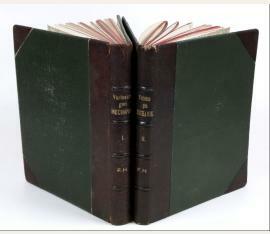 - Volume 1 contains "Vorlesung über Mechanik der starren Systeme. Gehalten fünfstündig im Wintersemester 1907/8 (vom Beginn 24. X, bis 14. II.)" (a piece of information that contradicts Bittner's statement [p. 335] that Hasenöhrl did not teach that winter semester). The first session was Hasenöhrl's inaugural lecture at Vienna University. He inherited Boltzmann's chair, who had taken his life in Duino in the fall of 1906. In the appointment process for the successor to Boltzmann, Hasenöhrl had prevailed against his older colleagues Max Planck and Wilhelm Wien. Appropriately, this inaugural lecture, the only one largely written in shorthand, is an obituary of his predecessor (not identical with his Boltzmann obituary published in "Elektrotechnik und Maschinenbau" 41 ). 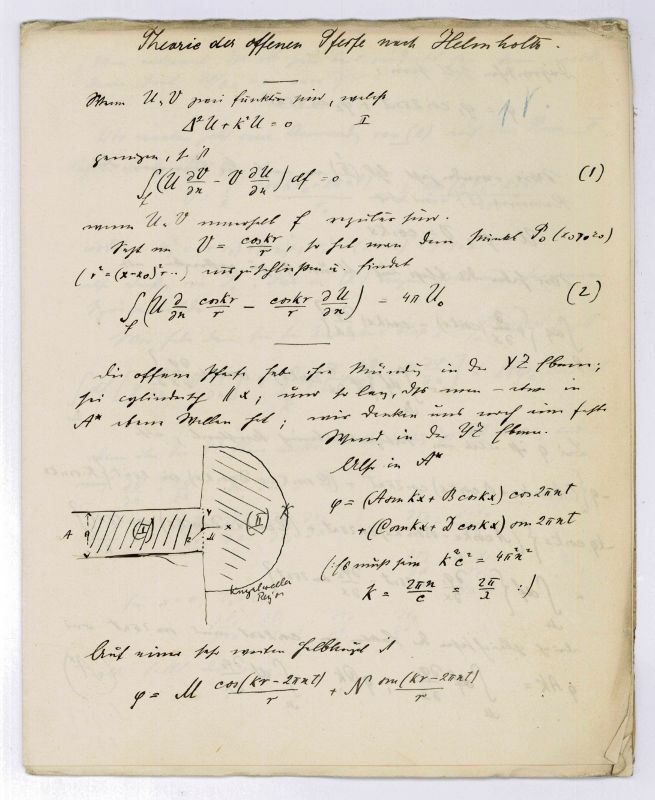 The remaining 28 chapters include "Kinematik des Punktes", Lagrange's equations, "Hamiltons partielle Differentialgleichung", and the theories of relative and cyclical movement. Red crayon markings indicate the progress made from session to session; individual problems are marked as having been treated in the seminary course rather than in the lecture hall. At the end (p. 305 ff. ), Hasenöhrl has included the changes made for the 1910/11 winter semester (according to Bittner, Hasenöhrl again repeated the lecture in 1913/14). 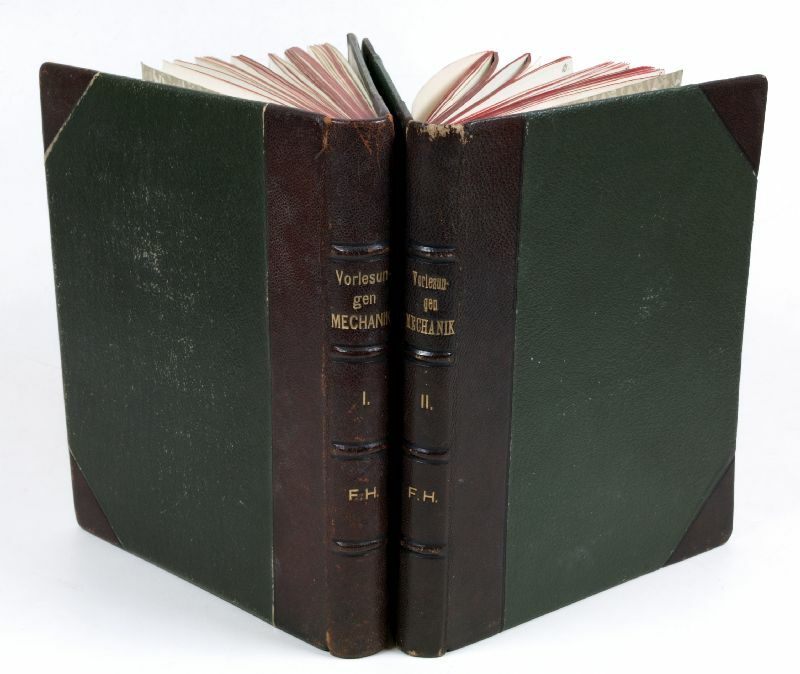 - Volume II contains the two-semester "Vorlesung über Mechanik der deformablen Körper" (winter semester of 1907/08: Elasticity; summer semester of 1908: Hydromechanics, of which latter course two weeks were lost due to the great student strike). Hasenöhrl prefixed a motto from Guido Ubaldi's "Paraphrasis in duos Archimedis aequeponderantium libros" (1588): "Quapropter ad Archimedem confugiendum est, si vera huius scientiae principia perdiscere cupimus." This volume likewise contains final changes made in 1911, constituting a thorough revision of pp. 90-101. In the summer of 1914 he revised the "slipshod pages 183 ff." about ray formation, which are partly struck out (p. 183f. ), partly removed altogether (p. 185f. ; the leaf is missing save for a narrow guard); these notes are followed by the sections "Allgemeines über Bewegung mit Rotationssym[m]etrie" and "Kreisförmige Wirbel" (13 pp. in total). Shortly before the end of the semester, the First World War erupted. Hasenöhrl, whose mother was descended from the old military nobility, volunteered for the infantry and was decorated after an injury in July 1915. In a battle near Folgaria he was killed by a shell splinter to his head on 7 October. - Although Hasenöhrl always spoke freely during his lectures (cf. Bittner, 198), rather than reading out a written text, as many of his colleagues did, it is clear that his presentation was based on minutely prepared notes. So closely did he compress the subject matter of his lectures that each session usually comprises a mere four to six pages in the manuscript; and still, we find in the text many tidily formulated paragraphs, including digressions on themes such as Sven Hedin's observations on the rivers of Tibet, which, when flowing south-north, are deflected eastwards - a practical example of relative movement. In his 1933 Nobel Prize acceptance speech, Erwin Schrödinger looked back on the gift of his teacher Hasenöhrl to discuss a subject matter in the lecture hall both extensively and closely: "The lecture cycle, which spanned eight semesters of five periods per week, treated the advanced theories of mechanics as well as the eigenvalue problems of continuum physics with the degree of detail that I would later need dearly - I have never been able to study from books with any ease [... He died in the War], and a feeling tells me that, but for that, it would be he who would be receiving this honor in my place today." In his 1904 treatise "On the Theory of Radiation in Moving Bodies", Hasenöhrl had applied the concept of "electromagnetic mass" to a cavity filled with radiation, arguing that any kind of thermal radiation provides such a body with an apparent increase of mass. 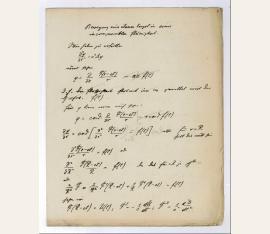 This achievement, which makes the connection of energy and mass and - in its most radically compressed form "m = E/c²" - seems to anticipate Einstein's special theory of relativity, won Hasenöhrl the 1905 Haitinger Prize (at Boltzmann's suggestion) and was the basis for his appointment to the Vienna Chair of Physics the following year. 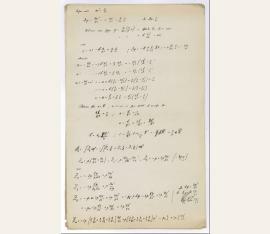 In 1905, Einstein generalised Hasenöhrl's equation (which the latter had applied only to cavity radiation) and managed to embed it within an encompassing theory, thus arriving at the iconic "E=mc²" equation (for Hasenöhrl's role in the development of the equation cf. Stephen Boughn's recent article, "Fritz Hasenöhrl and E=mc²", in: The European Physical Journal H 38/1 [Jan. 2013], p. 1-18). Incidentally, Hasenöhrl taught Einstein's theory of relativity in his lectures - a highly uncommon course topic for the time. In 1911, Hasenöhrl participated in the historic first "Conseil Solvay", the invitation-only Brussels conference that united the world's elite of experimental and theoretical physicists to discuss the fundamental problems of their field. Themed "La théorie du rayonnement et les quanta", that first conference tackled the various approaches of classical physics and the emerging quantum theory; among the other participants were Einstein, Marie Curie, Ernest Rutherford, H. A. Lorentz, Wilhelm Wien, Heike Kamerlingh Onnes, and Henri Poincaré. Hasenöhrl also participated in the second Solvay Conference in 1913. - Edges slightly frayed and dusty, otherwise perfect. Of the utmost rarity: Hasenöhrl manuscripts are considered virtually unobtainable; auction records since 1975 list not a single leaf of writing in his hand (in contrast with more than 1000 records for Albert Einstein, more than 100 of which are manuscripts). 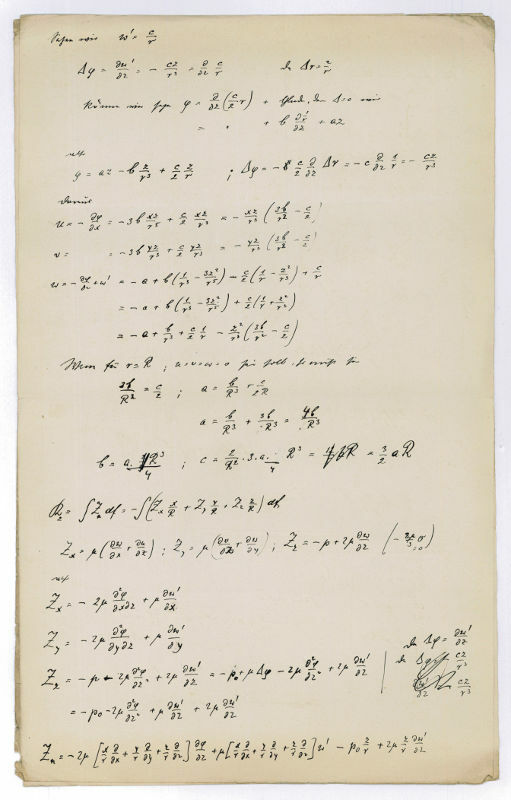 The Göttingen State Library holds a 17-page transcript of Hasenöhrl's lecture on spherical functions (Cod. Ms. G. Herglotz E 15) in the hand of the student Gustav Herglotz (1881-1953), later professor of Mathematics at Leipzig and Göttingen. The Austrian Central Library of Physics keeps an archive of Hasenöhrl material: a single-box corpus containing mainly photographs, offprints, and photocopies of personal documents, but no manuscripts at all (with the exception of a single page of equations on the reverse of a letter from a bookseller). Several letters by Hasenöhrl are to be found in the personal archives of scholars (e. g., to Prof. Stefan Meyer, in the Archives of the Institute for Radium Research, Austrian Academy of Sciences)..
österreichischer Physiker (1874-1915). Autogr. manuscript: "Theorie der offenen Pfeife nach Helmholtz". (Theory of the open pipe according to Helmholtz). [Wohl Wien]. 13 num. SS. auf gefalt. Doppelbögen, 3 unbeschriebene SS. am Schluß. Schwarze Tinte auf Papier; eine schematische Textskizze. Einige eigenh. Markierungen und Überarbeitungen in blauem Buntstift und Bleistift. 4to. He died in the War], and a feeling tells me that, but for that, it would be he who would be receiving this honor in my place today." In his 1904 treatise "On the Theory of Radiation in Moving Bodies", Hasenöhrl had applied the concept of "electromagnetic mass" to a cavity filled with radiation, arguing that any kind of thermal radiation provides such a body with an apparent increase of mass. 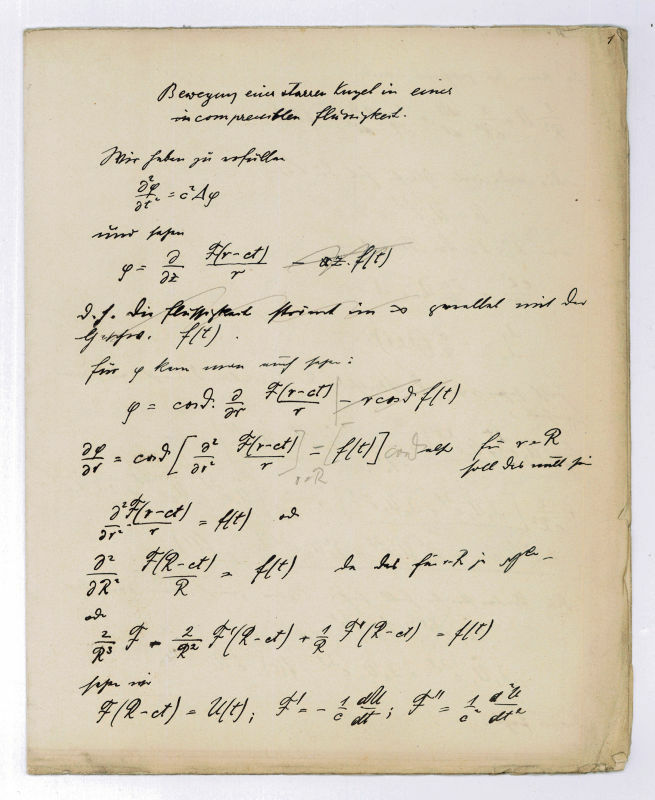 This achievement, which makes the connection of energy and mass and - in its most radically compressed form "m = E/c²" - seems to anticipate Einstein's special theory of relativity, won Hasenöhrl the 1905 Haitinger Prize (at Boltzmann's suggestion) and was the basis for his appointment to the Vienna Chair of Physics the following year. In 1905, Einstein generalised Hasenöhrl's equation (which the latter had applied only to cavity radiation) and managed to embed it within an encompassing theory, thus arriving at the iconic "E=mc²" equation (for Hasenöhrl's role in the development of the equation cf. Stephen Boughn's recent article, "Fritz Hasenöhrl and E=mc²", in: The European Physical Journal H 38/1 [Jan. 2013], p. 1-18). Incidentally, Hasenöhrl taught Einstein's theory of relativity in his lectures - a highly uncommon course topic for the time. In 1911, Hasenöhrl participated in the historic first "Conseil Solvay", the invitation-only Brussels conference that united the world's elite of experimental and theoretical physicists to discuss the fundamental problems of their field. Themed "La théorie du rayonnement et les quanta", that first conference tackled the various approaches of classical physics and the emerging quantum theory; among the other participants were Einstein, Marie Curie, Ernest Rutherford, H. A. Lorentz, Wilhelm Wien, Heike Kamerlingh Onnes, and Henri Poincaré. Hasenöhrl also participated in the second Solvay Conference in 1913. - Edges slightly frayed and dusty, otherwise perfect. Of the utmost rarity: Hasenöhrl manuscripts are considered virtually unobtainable; auction records since 1975 list not a single leaf of writing in his hand (in contrast with more than 1000 records for Albert Einstein, more than 100 of which are manuscripts). The Göttingen State Library holds a 17-page transcript of Hasenöhrl's lecture on spherical functions (Cod. Ms. G. Herglotz E 15) in the hand of the student Gustav Herglotz (1881-1953), later professor of Mathematics at Leipzig and Göttingen. The Austrian Central Library of Physics keeps an archive of Hasenöhrl material: a single-box corpus containing mainly photographs, offprints, and photocopies of personal documents, but no manuscripts at all (with the exception of a single page of equations on the reverse of a letter from a bookseller). Several letters by Hasenöhrl are to be found in the personal archives of scholars (e. g., to Prof. Stefan Meyer, in the Archives of the Institute for Radium Research, Austrian Academy of Sciences)..
österreichischer Physiker (1874-1915). Autogr. manuscript: "Bewegung einer starren Kugel in einer compressiblen Flüssigkeit" (Motion of a rigid sphere in a compressible liquid). [Wohl Wien]. 7 num. SS. auf gefalt. Doppelbögen, 1 unbeschriebene S. am Schluß. Schwarze Tinte auf Papier; einige eigenh. Überarbeitungen in Bleistift. 4to. österreichischer Physiker (1874-1915). Autogr. manuscript. [Wohl Wien]. 4 SS. Folio und 1½ SS. 4to. Schwarze Tinte auf Papier; einige eigenh. Überarbeitungen in Bleistift.